There are 1200+ Web 2.0 sites/services/links in 50+ categories. Pick a category. 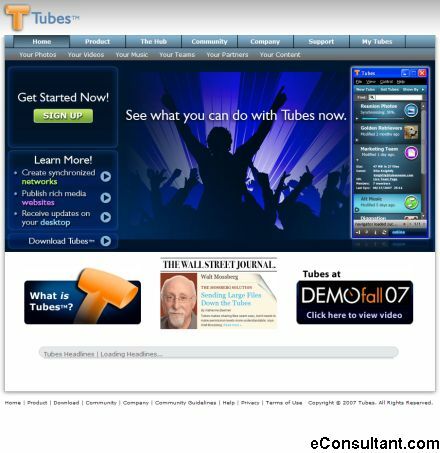 Description : Tubes is a revolutionary PC+web application designed to let you create instant personal sharing networks of friends, family, classmates, colleagues, or your own devices. Tubes lets you instantly share photos, music, video and documents with everyone you know and have them share their stuff with you through the same tube. With online backup and automatic syncing capabilities, Tubes is an effortless way to share, access and experience digital content across all your devices with all your communities. System Drivers: Is your PC running slow? Speed up your system with the latest System Drivers. Clean Registry: Is your PC running slow? Speed up your system with a Clean Registry. Web Hosting: Are you paying too much for web hosting? Compare prices in long list of Web Hosting providers.